TOKYO - With matcha taking over Malaysia by storm, we are seeing more and more ridiculous food with the matcha flavour. Most of the time, these recipes got so famous in other countries like Japan, we will have it here. 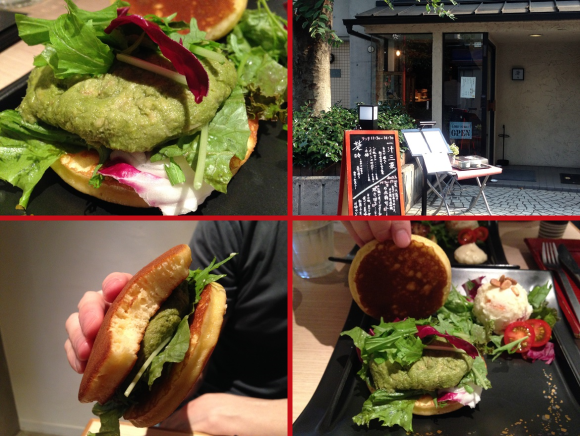 And now Daikanyama, Japan is also the place to go if you want to eat a matcha green tea tuna sandwich that even has one more surprise waiting in its ingredient list. Not far from Daikanyama Station is Soso, a stylish restaurant that serves its lunch menu from 11:30 a.m. until 2:30 in the afternoon, and its dinner options from 6 to midnight. From 2:30 to 5, the restaurant goes into what it calls “cafe time,” serving pretty much just drinks and desserts. There are two sandwiches which are available during Soso’s cafe time, though. Tuna sandwiches are pretty popular in Japan, but usually the flakes of fish are mixed with mayonnaise, just like they are in the West. Realizing that much of my life had been leading up to this moment of destiny, I stepped inside, took a seat, and placed my order. While there’s definitely a bit of zaniness to the idea of green tea tuna, Soso’s interior is anything but wacky, with soothing colors and simple, uncluttered decor (just the sort of thing to put your mind at ease if you’re feeling a twinge of anxiety about the prospect of eating matcha tuna). The food’s presentation was as elegant as the restaurant’s interior, and the server laid down a plate with my 980-yen sandwich accompanied by some mixed greens, a sliced cherry tomato, and a scoop of Japanese-style potato salad (which is less watery than the American kind). As for the sandwich, it’s about as green on the inside as you could imagine, with a few pieces of red cabbage being just about the only non-verdant element between the bread. Soso’s chefs mix the tuna with matcha powder and syrup, giving it a captivating color and faint aroma of tea. Getting back to the bread, you might have noticed that it’s unusually thick. That’s because the top and bottom halves of the sandwich are actually dorayaki, palm-sized circular cakes that are usually filled with sweet bean paste to make one of Japan’s favorite traditional sweets. For the matcha tuna sandwich (which contains no sweet beans), the dorayaki serve as the bun. Without sweet beans, the dorayaki taste like ever-so-slightly-sweet pancakes, and have a similar fluffy texture. Surprisingly, for as dramatic as the matcha tuna looks, the flavor isn’t all that shocking. The mix of matcha powder and syrup eliminates the mayonnaise-based sourness you’ll find in normal tuna sandwiches, replacing it with a very mild sweetness and just a hint of bitter tea as you chew a bite. It actually makes for a tremendously satisfying combination with the subtle sweetness of the dorayaki. In another contrast to its appearance, it’s not all that heavy either, and polishing it off, along with the accompanying salad, actually left me feeling surprisingly full but not at all bloated. In short, the matcha tuna sandwich is something I never knew I wanted, but my life now feels richer thanks to that newfound knowledge. Oh, and if you’re intrigued by the idea of a dorayaki sandwich, but matcha tuna doesn’t get your mouth watering, Soso also has a tsukune (ground chicken) dorayaki sandwich that’s also available during cafe time.